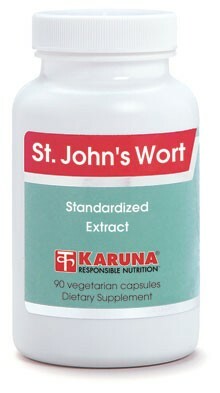 St. John's Wort has emerged as the leading botanical product for enhanced mood and well-being. St. John's Wort contains numerous substances, including hypericin, which have been shown to modulate neurotransmitter activity as well as other aspects of neuroendocrine function. Included in these effects are inhibition of both monoamine oxidase and serotonin reuptake. Extracts standardized for 0.3% hypericin content are routinely used in clinical studies of St. John's Wort. St. John's Wort (Hypericum perforatum) contains hypericin and related substances that modulate the activity of several neurotransmitters, including serotonin, norepinephrine and dopamine (Pharmacopsychiatry 2001;34:45-9; Ann Pharmacother 1998;32:1201-8). St. John's Wort also contains flavonoids that also contribute to its neuroendocrine effects (Planta Med 2004;70:1008-11). Clinical studies with St. John's Wort extract have demonstrated that this herb helps support normal psychological mood on par with other available treatments(Cochrane Database Syst rev 2008;4:CD000448; AM Fam Physician 2005;72:2249-54). Suggested use for adults: One capsule, 2-3 times daily, before meals, or as directed. CAUTION: This product should not be combined with antidepressant medication.